Kath in a National Institute for Health Research (NIHR) Knowledge Mobilisation Research Fellow. She is a sociologist with a particular interest in public involvement and community engagement. She works in the European Centre for the Environment and Human Health, and supports the Health and Environment Public Engagement (HEPE) group in Cornwall. She completed her PhD in 2014 at the Peninsula College of Medicine and Dentistry with a theses entitled 'Public and Patient Involvement in Theory and in Practice'. This was supported by the NIHR Collaboration for Leadership in Applied Health Research and Care, PenCLAHRC. 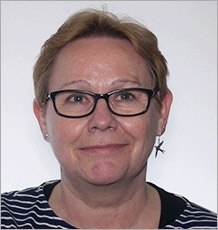 Before undertaking that study Kath had been one of the founder members of the PenCLAHRC public and patient involvement group (PenPIG). Mobilising knowledge to patients and wider publics. What works and who does it work for? described by sociologists as ‘knowledge spaces’. These are where people with different sorts of knowledge meet, to share perspectives about an issue. Knowledge spaces in health and social care may involve several professionals (researchers/clinicians/managers/commissioners/public health officials, etc.) engaging with lay publics (patients/carers/citizens and communities). activist groups campaigning about patient safety or service provision. Policy makers and funders identify patient and public involvement/engagement as a priority, Ideally knowledge is mobilised in both directions, to inform individual health/lifestyle decisions, and to design/commission better services/interventions. But if done badly it can be experienced as tokenistic and alienating. Interactions between multiple stakeholders and their different relationship with organisational, social and policy contexts make these ‘knowledge spaces’ intrinsically complex. This makes it implausible that a single approach to addressing KMb will be straightforwardly transferrable to all settings. By combining a realist review with participatory action research methodology KMb mechanisms will be identified and used to tailor and trial individual KMb strategies. Community based knowledge champions will be identified and supported. By supporting educators involving patients and communities in medical teaching, this learning can be embedded in developing curricula. In complex cross-sectoral health ‘knowledge spaces’ which include multiple stakeholders, what enables the KMb that addresses different stakeholder priorities and what can be done to foster that process? advance theoretical understandings of structures and processes. Looking at how smart technology can support health and welbeing in the community. Maguire K, Britten N (In Press). 'You're there because you are unprofessional': patient and public involvement as liminal knowledge spaces. Sociol Health Illn, 40(3), 463-477. 'You're there because you are unprofessional': patient and public involvement as liminal knowledge spaces. Patient and public involvement in health research and care has been repeatedly theorised using the metaphor of spaces, knowledge spaces and participatory citizenship spaces. Drawing on data from a three year qualitative study of people involved in health research with organisations across England, this article explores where these spaces fit in a wider social, political and historical landscape. It outlines a theme recurring frequently in the study data: a unified public/patient/service-user perspective in opposition to a professional/clinical/academic view. This is discussed in relation to Habermas's division between the lifeworld and system. Patient and public involvement is mapped as spaces between these spheres, therefore between the social norms pertaining to them. In this way, involvement spaces are seen as liminal, in-between or threshold spaces; this concept provides us with new insights on both the opportunities and the conflicts that are integral in the ambiguous, complex interactions which take place in these spaces. Gibson A, Boddy K, Maguire K, Britten N (In Press). Exploring the impact of providing evidence-based medicine training to service users. Research Involvement and Engagement, 1, 1-13. Full text. Maguire K, Garside R, Poland J, Fleming LE, Alcock I, Taylor T, Macintyre H, Lo Iacono G, Green A, Wheeler BW, et al (2019). Public involvement in research about environmental change and health: a case study. Health, 23(2), 215-233. Public involvement in research about environmental change and health: a case study. Involving and engaging the public are crucial for effective prioritisation, dissemination and implementation of research about the complex interactions between environments and health. Involvement is also important to funders and policy makers who often see it as vital for building trust and justifying the investment of public money. In public health research, ‘the public’ can seem an amorphous target for researchers to engage with, and the short-term nature of research projects can be a challenge. Technocratic and pedagogical approaches have frequently met with resistance, so public involvement needs to be seen in the context of a history which includes contested truths, power inequalities and political activism. It is therefore vital for researchers and policy makers, as well as public contributors, to share best practice and to explore the challenges encountered in public involvement and engagement. This article presents a theoretically informed case study of the contributions made by the Health and Environment Public Engagement Group to the work of the National Institute for Health Research (NIHR) Health Protection Research Unit in Environmental Change and Health (HPRU-ECH). We describe how Health and Environment Public Engagement Group has provided researchers in the HPRU-ECH with a vehicle to support access to public views on multiple aspects of the research work across three workshops, discussion of ongoing research issues at meetings and supporting dissemination to local government partners, as well as public representation on the HPRU-ECH Advisory Board. We conclude that institutional support for standing public involvement groups can provide conduits for connecting public with policy makers and academic institutions. This can enable public involvement and engagement, which would be difficult, if not impossible, to achieve in individual short-term and unconnected research projects. Fleming LE, Leonardi GS, White MP, Medlock J, Alcock I, Macintyre HL, Maguire K, Nichols G, Wheeler BW, Morris G, et al (2018). Beyond climate change and health: Integrating broader environmental change and natural environments for public health protection and promotion in the UK. Atmosphere, 9(7). © 2018 by the authors. Increasingly, the potential short and long-term impacts of climate change on human health and wellbeing are being demonstrated. However, other environmental change factors, particularly relating to the natural environment, need to be taken into account to understand the totality of these interactions and impacts. This paper provides an overview of ongoing research in the Health Protection Research Unit (HPRU) on Environmental Change and Health, particularly around the positive and negative effects of the natural environment on human health and well-being and primarily within a UK context. In addition to exploring the potential increasing risks to human health from water-borne and vector-borne diseases and from exposure to aeroallergens such as pollen, this paper also demonstrates the potential opportunities and co-benefits to human physical and mental health from interacting with the natural environment. The involvement of a Health and Environment Public Engagement (HEPE) group as a public forum of "critical friends" has proven useful for prioritising and exploring some of this research; such public involvement is essential to minimise public health risks and maximise the benefits which are identified from this research into environmental change and human health. Research gaps are identified and recommendations made for future research into the risks, benefits and potential opportunities of climate and other environmental change on human and planetary health. Maguire K, Britten N (2017). “How can anybody be representative for those kind of people?” Forms of patient representation in health research, and why it is always contestable. Social Science & Medicine, 183, 62-69. Full text. Britten N, Maguire K (2016). Lay knowledge, social movements and the use of medicines: Personal reflections. Health (London), 20(2), 77-93. Morris C, Blake S, Stimson A, Borek A, Maguire K (2016). Resources for parents raising a disabled child in the UK. Paediatrics and Child Health (United Kingdom) Full text. Gibson A, Boddy K, Maguire K, Britten N (2015). Exploring the impact of providing evidence-based medicine training to service users. Research Involvement and Engagement, 1(1). Maguire K, Jones E, Williams-Yesson B, Stevens S (2014). Valuing patient and public involvement in research. Nurs Times, 110(45), 22-23. Valuing patient and public involvement in research. Patient and public involvement is now mandatory in funding applications for most health sciences research. This article offers a snapshot of views from patients and the public on their role in the research process. Maguire K (2006). Active Governance: the value added by community involvement in governance. Joseph Rowntree Foundation, York, Joseph Rowntree Foundation. Full text. Maguire K (2017). Talking About Research Using Games, Models, Maps, and Stories. participants, researchers and the public, and also between researchers from different academic disciplines. Abstract. Full text. Web link. Maguire K (2014). Public and Patient Involvement in Theory and in Practice. There is increasing interest in the theoretical underpinning of involving patients and the public, in health research and care, as coproduces and partners. Beginning from an ethical position that sees knowledge as a social product, it argues that involvement can demonstrate the public ownership of knowledge. were translated into games and stories, prompting further discussions with both public involvement participants and academics. publics they may empower participation in campaigning and decision making. Conservation and change are not only matters of how organisations respond to involvement, individual participants may experience knowledge spaces as arenas through which their sense of self is maintained, transformed or reconstructed, where they connect their personal narratives to the creation of human knowledge. participant orientations, makes it all the more important for participants, (clinical, academic and lay) to reflect upon and share their own. motivations and values. This means examining drivers and pre-existing theoretical baggage to ensure that none of these obscure the appreciation of and engagement with alternate views.The pursuit of strategic aims through these spaces requires communicative action.